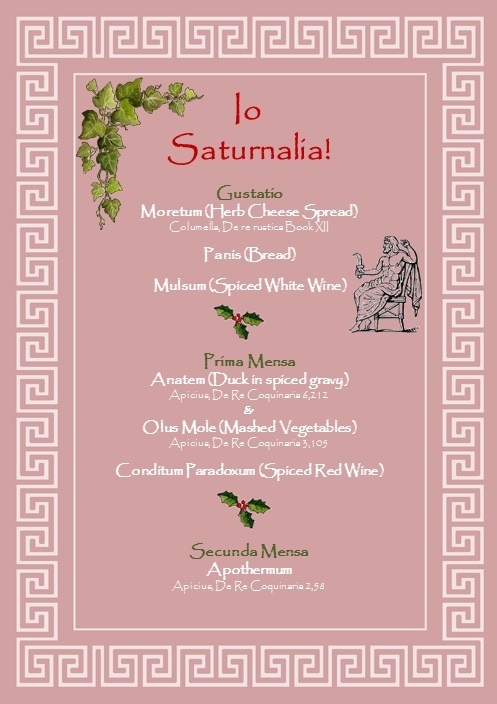 December 17 marked the beginning of Saturnalia, one of the most popular festivals in Ancient Rome. 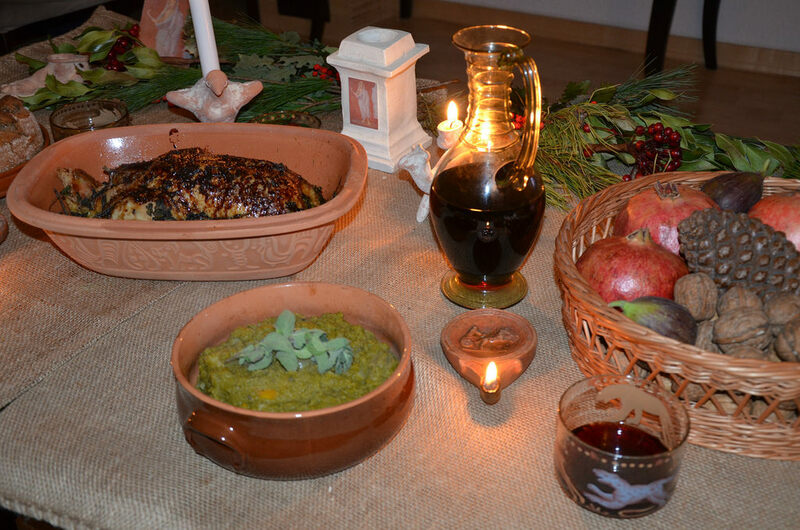 The midwinter celebrations lasted for several days (the number changed through the Roman era) and it was a time of feasting, partying, playing games, gift-giving and role-reversal. It was the merriest festival of the year and all work and business were suspended. Illustration from the 4th century AD depicting a man enjoying a game of dice. Playing games was an important feature of the Saturnalia celebrations. Saturnalia originated as a farmer’s festival to mark the end of the autumn planting season in honour of Saturnus and, despite Livy’s claim that the festival was established in 496 BC, there is evidence that it began much earlier. 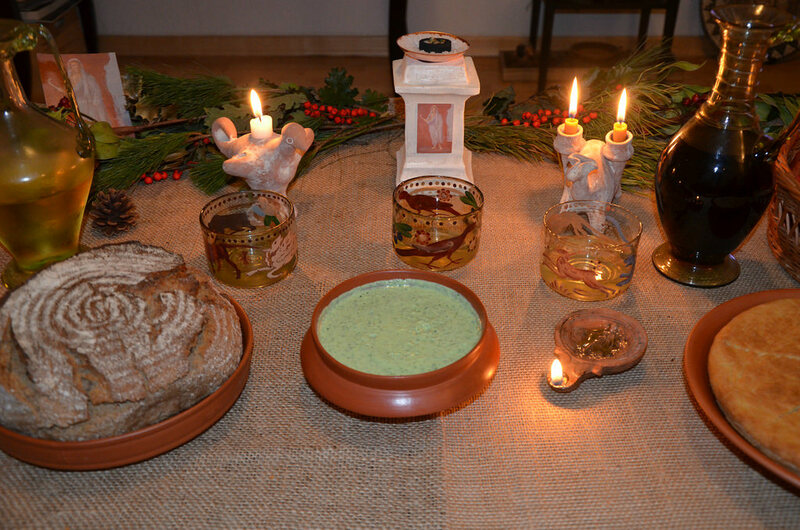 Originally the festival was celebrated on a single day, on the fourteenth before the Kalends of January (December 19), but it was later extended to three days. With the Julian reform of the calendar, Saturnalia was celebrated sixteen days before the Kalends of January (December 17). However, by the end of the Republic the festival was so popular that it expanded to cover a week. The emperor Augustus would shorten it to a three-day holiday during his reign but Caligula later extended it to five days. According to the author Macrobius, the celebration of Saturnalia was extended with the Sigallaria on the 10th day before the Kalends (December 23) so named for the small terracotta figurines which were sold in Roman shops and given as gifts to children. Saturnalia was described by 1st century AD poet Gaius Valerius Catullus as “the best of days”. It was certainly the most popular holiday in the Roman calendar. The god Saturnus, who gave his name to the festival, was regarded as chief of the Roman gods. The Romans equated him with the Greek agricultural deity Kronos. Exiled from Olympus by Zeus, Saturnus ruled Latium in a happy and innocent “golden age”, a time when peace, harmony and prosperity prevailed. Depictions of the god in surviving art show him as a bearded man wearing a veil and brandishing a sickle or a scythe (the symbols of his agricultural function). Saturn with head protected by winter cloak, holding a sickle in his right hand, fresco from the House of the Dioscuri at Pompeii. In Rome, the celebrations began with a sacrifice at the Temple of Saturnus located at the western end of the Forum Romanum and thought to be the oldest Roman temple. Following the sacrifice, a lectisternium was held by placing the deity’s image on a sumptuous couch (lectus) with tables and offerings before him, as if Saturnus was really partaking of the things offered in sacrifice and participating in the festivities. The cult statue of Saturnus was usually tied together with wool throughout the year but during his festival it was freed from his chains as an act of liberation. A public banquet followed (convivium publicum). The Remains of the Temple of Saturn in the Roman Forum (left). After the official rituals, the celebrants would go out to the streets and shout the holiday greeting ‘IO Saturnalia’. It was followed by several days of feasting and fun. To celebrate the festive season in style, I made my own Saturnalia altar. My 2018 homemade Saturnalia altar. Hadrian is wearing the pilleum, as was the tradition during the festival. These pointy hats were traditionally worn by freedmen but during Saturnalia all men, regardless of status, wore the pilleum. Hadrian is set among foliage, holly (sacred to Saturn), pine leaves, candles and images of the god Saturn. 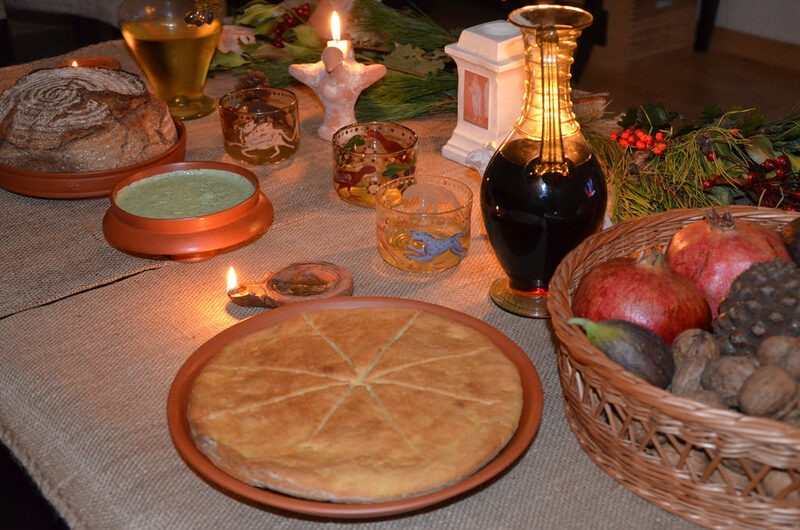 During the winter festival, the Romans decorated their homes with greenery. Garlands and evergreen wreaths bearing red berries were hung over doorways and windows. Images of the god Saturn were placed around the altar, candles were lit and a suckling pig was sacrificed to the god. In addition to the large-scale public feasts at the Temple of Saturnus, there was lots of eating and drinking at home and slaves were allowed to join in. All schools were closed and most businesses were suspended. Dress codes were relaxed and the whole population ditch the traditional toga in favour of something more relax and comfortable. Men and women would dress in brightly coloured tunics called synthesis (meaning “put together”), creating a carnivalesque atmosphere. Children could play at home and received toys as gifts. Saturnalia also saw the inversion of social roles. For example, slaves were permitted to dine with their masters and even demand to be served by them. Adults would also serve children. People would wear a cap of freedom (the pilleum) which was usually worn by slaves who had been set free. Slaves, who ordinarily were not entitled to wear the pilleum, wore it as well, so that everyone enjoyed the same status. It was a time of free speech -the poet Horace calls it “December liberty”- and slaves were even allowed to disobey a command without being punished. Instead of working, slaves could spend their time playing dice and other games, drinking, feasting and enjoying themselves. Gambling and dice-playing in public, normally forbidden, were permitted for all during Saturnalia. Children usually used nuts as gambling tokens. On the first day of Saturnalia, a Princeps Saturnalia was appointed among the whole household by throwing the dice. The King of Saturnalia presided over and could command people to do things like to prepare a banquet or sing a song. According to Tacitus (Annals 13.15), the young Nero played that role and mockingly commanded his younger step-brother Britannicus to sing. Fresco with a scene of a banquet. The last day of Saturnalia (23rd December) was a day of gift-giving when candles as well as small clay or wax figurines (sigillariae) were exchanged as gifts. Other presents could be given too. In his many poems about Saturnalia, Martial names both expensive and cheap gifts, including writing tablets, dice, knucklebones, moneyboxes, combs, toothpicks, a hat, a lyre, a hunting knife, oil lamps, perfumes, pipes, a pig, a parrot, a Priapus made of pastry, wine cups and spoons. The Emperor Augustus was particularly fond of gag gifts while Hadrian often surprised his friends with presents. At the Saturnalia and Sigillaria he [Hadrian] often surprised his friends with presents, and he gladly received gifts from them and again gave others in return. Two days after the end of Saturnalia, on December 25th, the Romans observed the birthday of the major imperial deity Sol Invictus, the Unconquered Sun-god, whose resurgence on the winter solstice initiated the daily increase in the hours of sunlight. 1,900 years ago Hadrian was celebrating his first Saturnalia festival as Emperor in Nicomedia, the capital of the province of Pontus and Bythinia in worth-west Asia Minor. Nicomedia was the home of the intellectual Arrian (Lucius Flavius Arrianus) who was to be Hadrian’s life-long friend. It would be reasonable to speculate that they celebrated Saturnalia together. 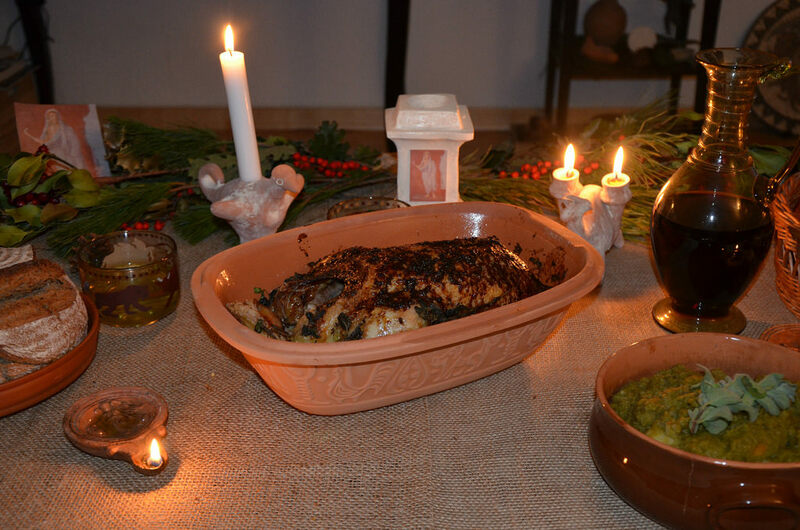 Yesterday I partied like it was 117 AD as I organised a small banquet at home on the occasion. 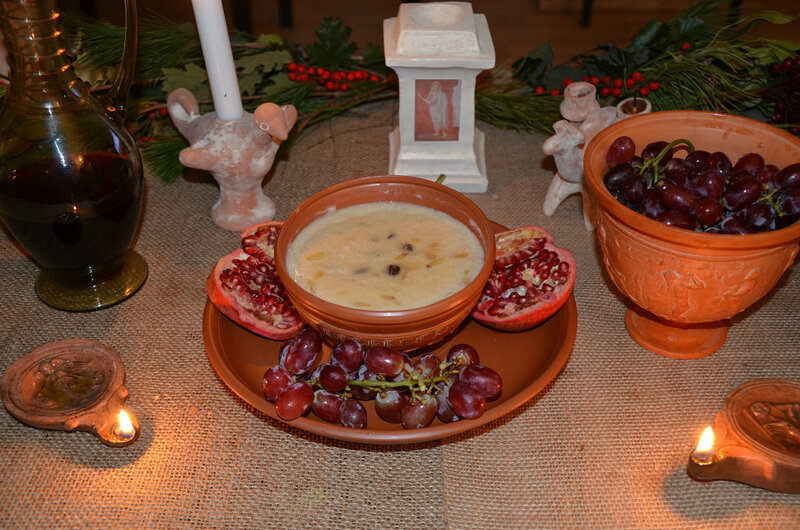 I love ancient Roman food and for this banquet I tried a few more ancient recipes. Once again, everything was so delicious! It is quite enjoyable to read about the Saturnalia (7 days of celebrations from December 17 to 23) and see parallels to our current Christmas. This is my favorite corner of the internet. Thank you for keeping this history alive. Your panis looks perfect, too!! Thank you very much for such interestings historical informations you give.